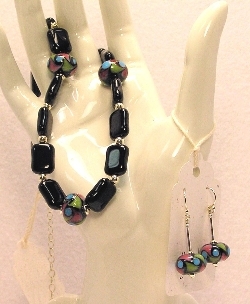 Sterling silver drop earrings with handmade lampwork multi colored beads and sterling silver beads. Absolutely gorgeous. Please note: these earrings will be made as close as possible to the ones shown above. Because lampwork beads are individually made by hand, each piece will be unique.